I have three clumps of lily turf in one of my woodland beds in my permaculture mini-woodland. 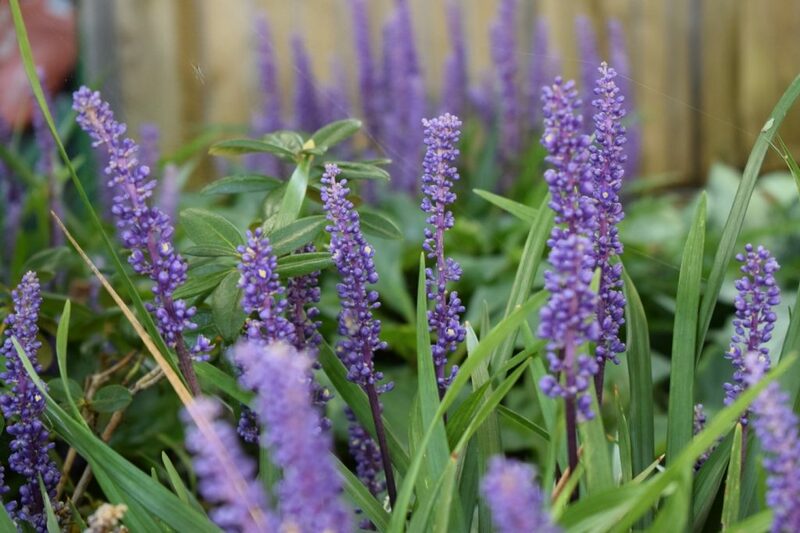 They have been there for well over five years, but have only ever produced a few sparse flower spikes each year, despite the evergreen foliage having clumped up nicely. So imagine my surprise and delight when they blessed me with a wonderful display this year. Lily turf is native to East Asia (China, Japan, and Korea) occurring in shady forests. The wild variety, along with some of the early cultivars, has pale mauve flowers — which look rather washed out in the garden setting. 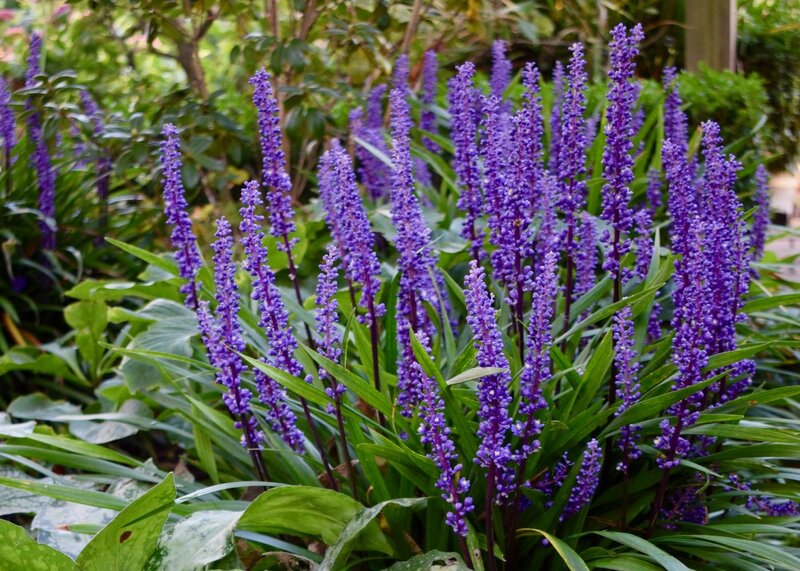 Improved breeds, such as ‘Big Blue’ have a deeper violet colouration which elevates them to garden stardom. 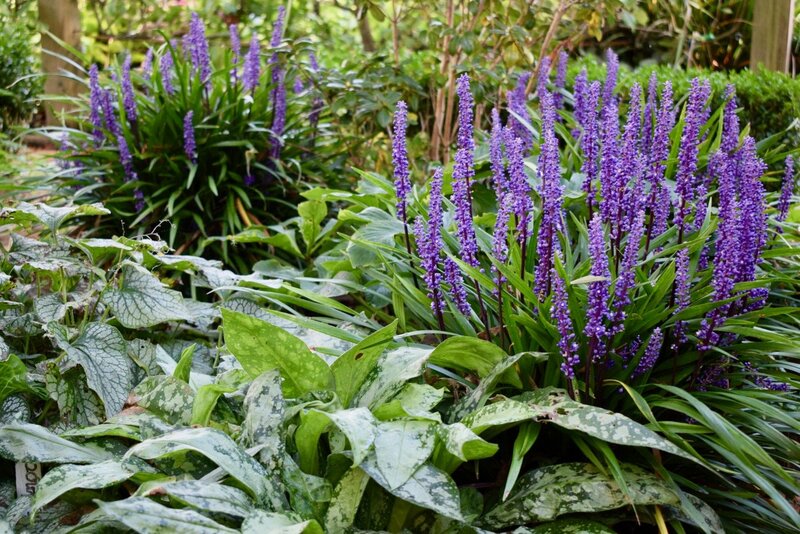 You can see them here contrasting nicely with the foliage of Brunnera ‘Jack Frost’ in the foreground — a bit tatty at this end of the season — and the equally silvery foliage of Pulmonaria sp. The violet and silver work well together I think. 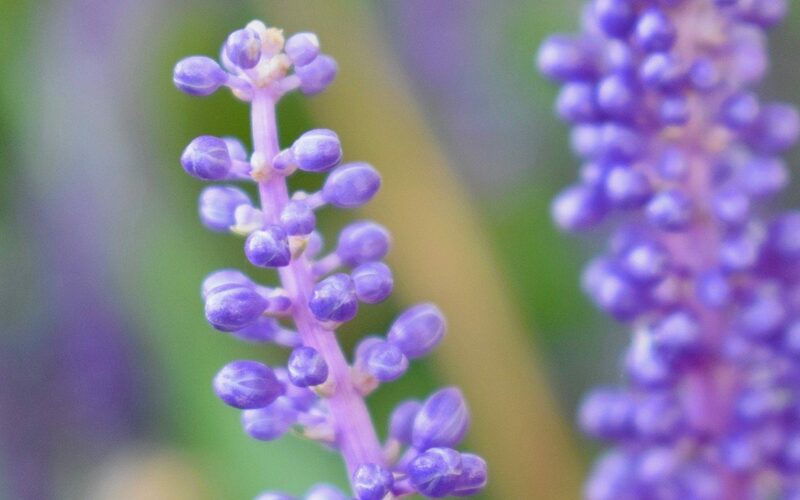 The flower spikes of Lily turf are strange things, somewhat resembling Grape hyacinths: upright turrets of little purple baubles, their metallic sheen making them appear almost artificial. 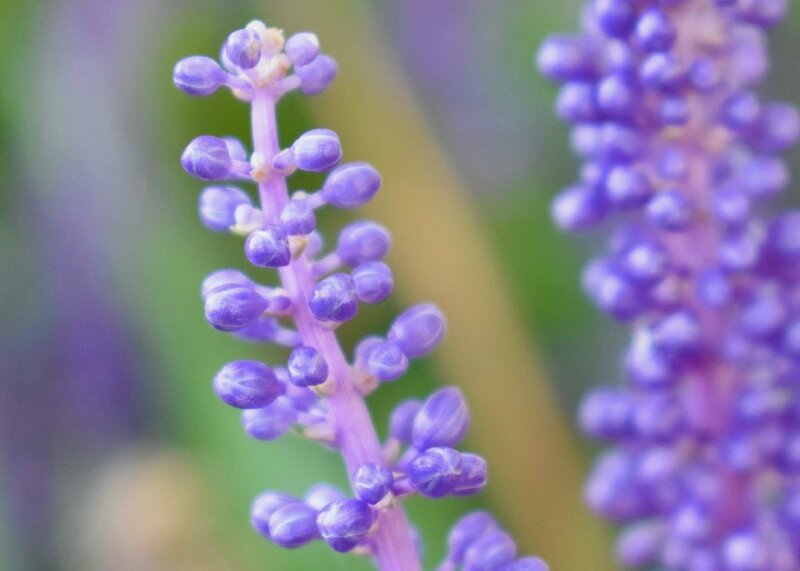 Their similarity to Grape hyacinths (Muscari sp.) 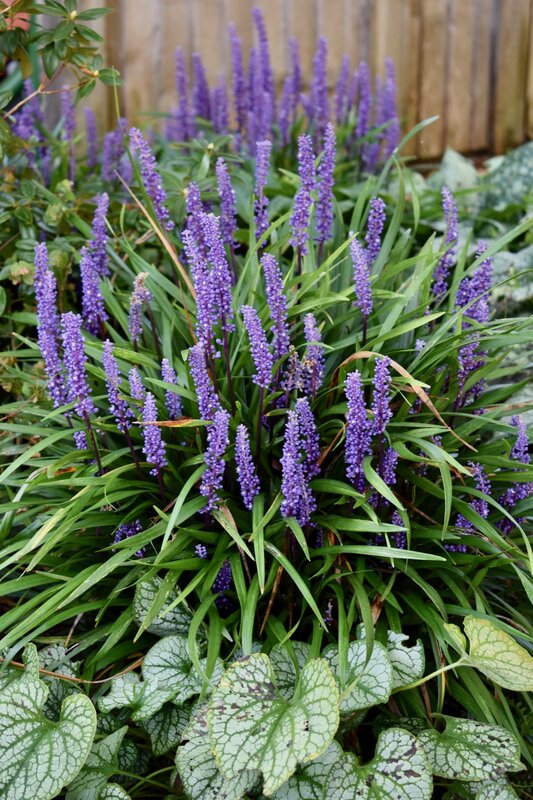 is recognised in the Latin name of Lily Turf: Liriope muscari. Flowers this late in the year are especially welcome in the shade garden as most woodland flowers blossom early in the spring racing for the sun before the canopy closes and shade takes over. Lily turf is happy to wait for Autumn before putting on its display which is jolly decent of it. I’m not sure why mine have flowered so prolifically this year. Perhaps it was the hot summer, or recent rains, or because I thinned the cherry tree above it increasing its light this year? Who knows. Gardens are so often a mystery. Getting in really close the structure fo the flower-spikes is revealed. 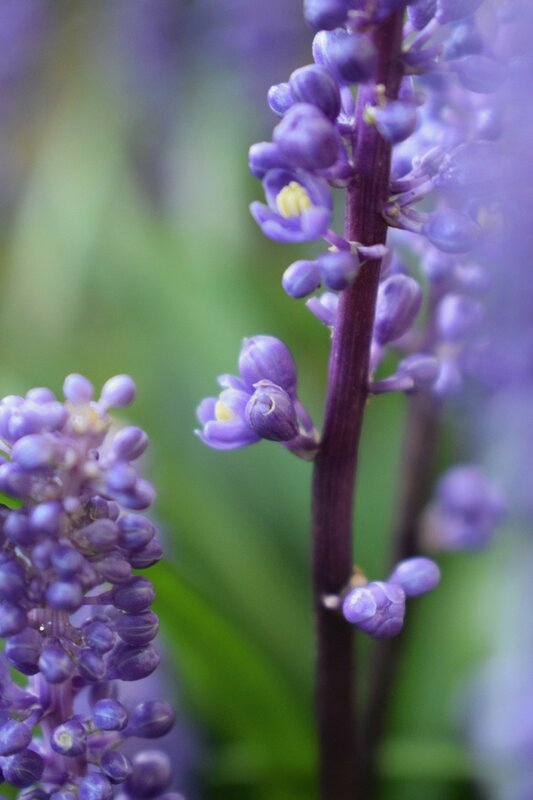 The purple-black stems are studded with a multitude of little purple bobbles, which open sporadically showing off their pale yellow stamens cupped in six tiny petals, just a few millimetres across. Apparently, the flowers may be followed by black berries that persist through the winter. I’ve never seen these, but if they come this year I’ll add some photos to the end of this post.